In my previous blog post, I explored the differences, advantages, and disadvantages of three of the most popular Node.js frameworks: Express, Koa, and Hapi. In this blog post, I’m going to examine the differences between three more very popular frameworks: Next, Nuxt, and Nest. These three frameworks are server-side rendering, and they are closely related to React, Vue, and Angular (the three most widely used front-end frameworks), respectively. Popularity (GitHub Stars and npm downloads). Next is the most popular framework compared to the other two. It has more npm weekly downloads, GitHub stars and number of contributors. Next.js is a React framework that lets you build server-side rendering and static web applications using React. After that, the file-system is the main API. Every .js file becomes a route that gets automatically processed and rendered. Then just run npm run dev and go to http://localhost:3000. To use another port, you can run npm run dev -- -p <your port here>. 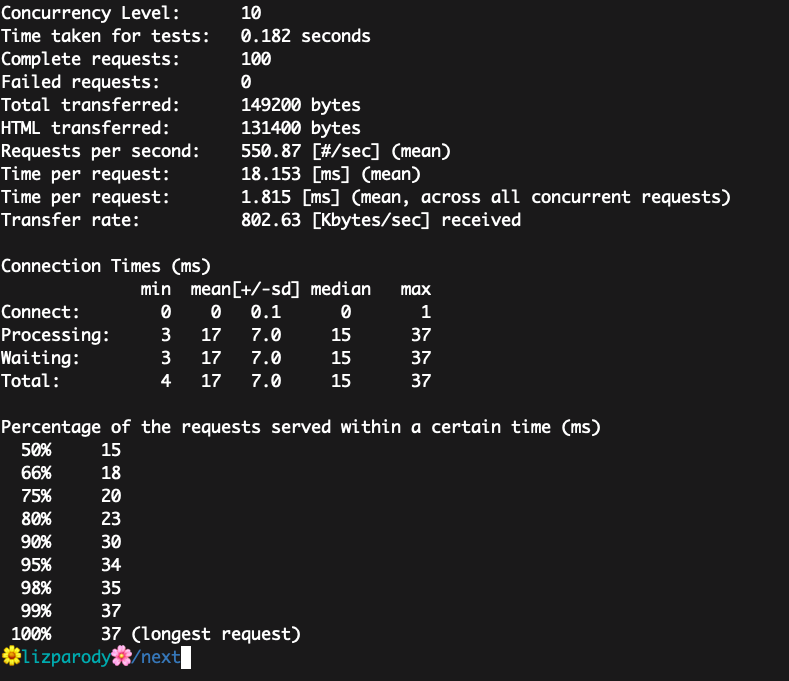 To measure the performance, I used Apache Bench for benchmarking, which highlights how many requests per second the app is capable of serving. 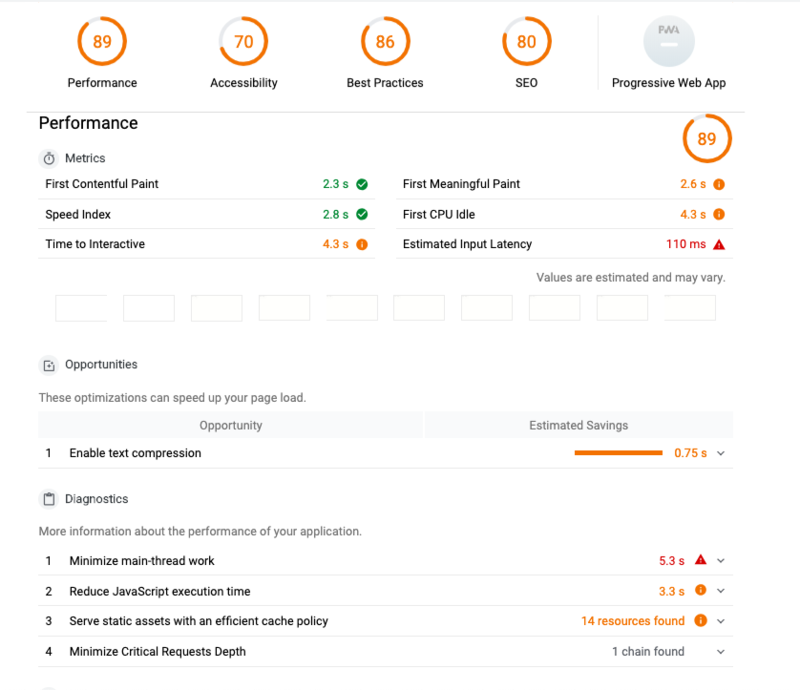 I also used lighthouse to audit performance, accessibility, best practices, and SEO. This is a basic Hello World app in Next.js. 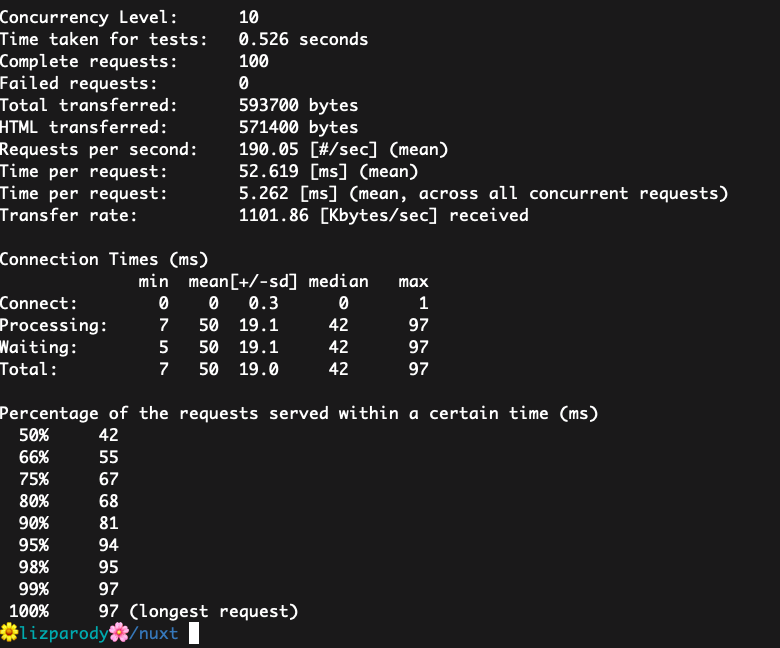 It handles 550.87 requests per second. This value is the result of dividing the number of requests by the total time taken. The average time spent per request is 18.153 ms. 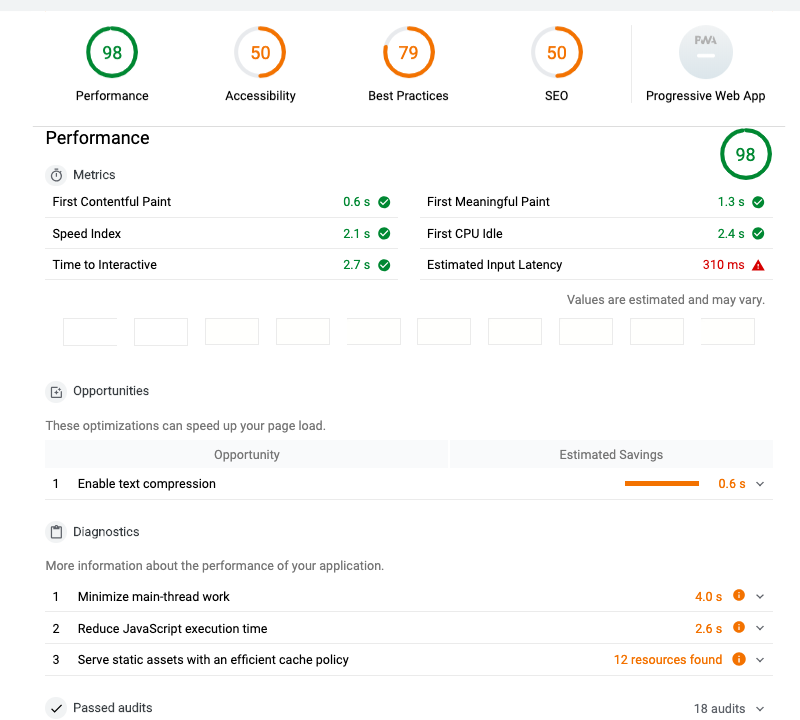 In the report provided by lighthouse, we can see that the performance, accessibility, best practices, and SEO scores are all above 70, which is good, but compared with the other two frameworks, it had the lowest score for Performance and has the highest score in Best Practices. The Next.js community communicates through chat, slack, issues and pull request on GitHub. Nuxt is a Vue.js Meta Framework to create complex, fast, and universal web applications quickly. You can start directly with the CLI create-nuxt-app for the latest updates. Lack of some common solid plugins/components. (Google maps, calendar, vector maps). Some components for that exist, but they are generally not very well maintained. It is necessary to go deep in more complex components/plugins. If you want to develop something very flexible, you have to get down to render functions/jsx to do that. (e.g render the contents of a slot in another place/component). Props have to be specified explicitly. There might be cases when you want to transform some CSS classes to props; you’ll have to specify these props or use $attrs / render functions or jsx. Reactivity caveats like setting an item from an array directly this.items[key]=value or adding a new data property. This is a basic Hello World app in Nuxt.js. 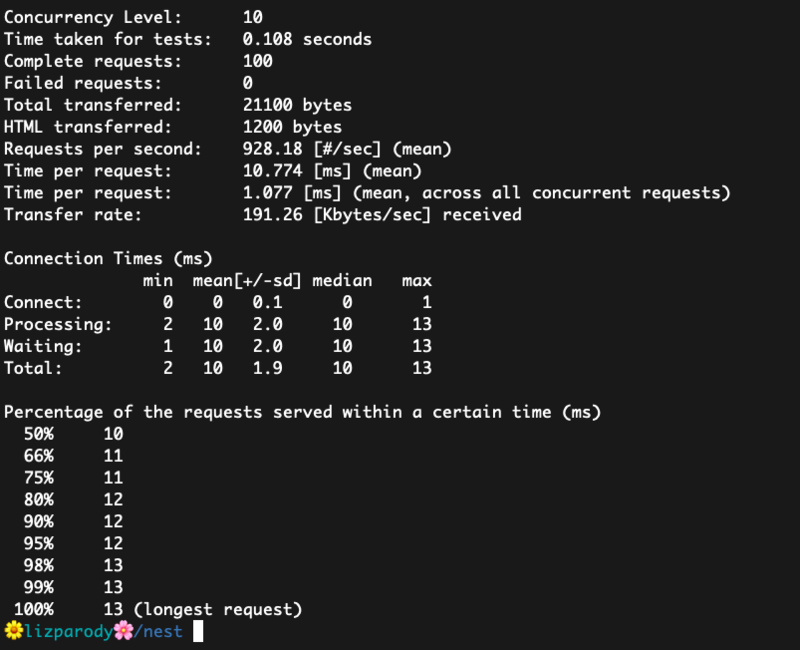 It handles 190.05 requests per second. The average time spent per request is 52.619 ms. On this metric, Nuxt.js performs the worst compared to the other two frameworks. Nuxt.js has the highest score in three of the four measures; performance, accesibility and SEO. There is a GitHub organization where you can find modules and projects from the Nuxt.js community. There is also a curated list of awesome things related to Nuxt.js awesome-nuxt including Modules, tools, mention of Nuxt.js, showcase, tutorials, blogs, books, starter template, official examples, and projects using Nuxt.js. Under the hood, Nest makes use of Express, but also provides compatibility with a wide range of other libraries, like e.g. Fastify, allowing for easy use of the myriad third-party plugins which are available. After installing Nest.js with the npm cli command, and creating a new project with nest new project-name, a src/ directory will be created and populated with several core files, including main.ts. The framework is very annotation-driven, with everything from endpoints to Swagger documentation being generated from them. The endpoints are clean and simple, and the annotations make developing simpler all around. The folder structure in Nest.js is heavily based on Angular. This allows for minimal downtime when first designing a Nest service. Components get their own folders, with an application module and main file residing in the root. This simple structure allows more attention to be paid to the design of endpoints and their consumers, instead of application structure. Similar to Angular, Nest also has a decent command line tool, available through Node Package Manager, nestjs/cli. The command line tool will let you scaffold the project, generate Nest architecture components, and display project information. The largest risk facing Nest users is the lack of documentation. The framework has great integrations with other frameworks but the documentation is minimal and doesn’t cover any issues that may arise. Nest does hold an edge in its use of TypeScript and relation to Angular, but it doesn’t have the backing power of a large enterprise behind it. This is a basic Hello World app in Nest.js. It handles 928.18 requests per second. The average time spent per request is 10.774 ms. On this metric, Nest.js performed the best out of the three frameworks we compared. 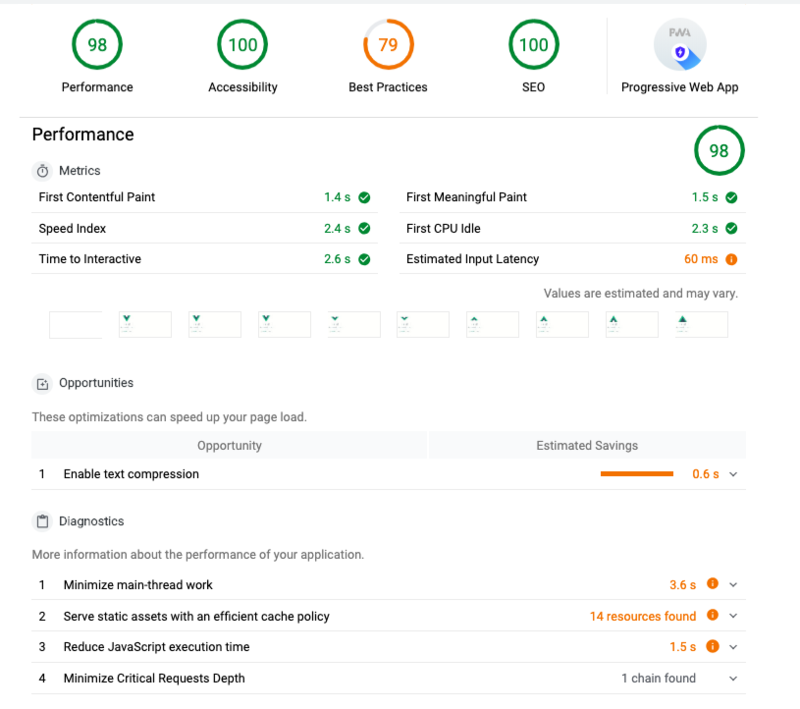 In the report provided by lighthouse, Nest.js has a very high performance, but scored comparatively lower on other key factors:accessibility, best practices and SEO. There is a group of developers providing handy packages on NestJS Community organization GitHub. Some of their popular packages are: nestjs-config, a config module for NestJS using dotenv. nest-access-control, Role and Attribute-based access control for NestJS and nestjs-flub, pretty error stack viewer. Even if Nest is not the most popular framework, is the one that has the better performance and has many advantages. You should give it a try!